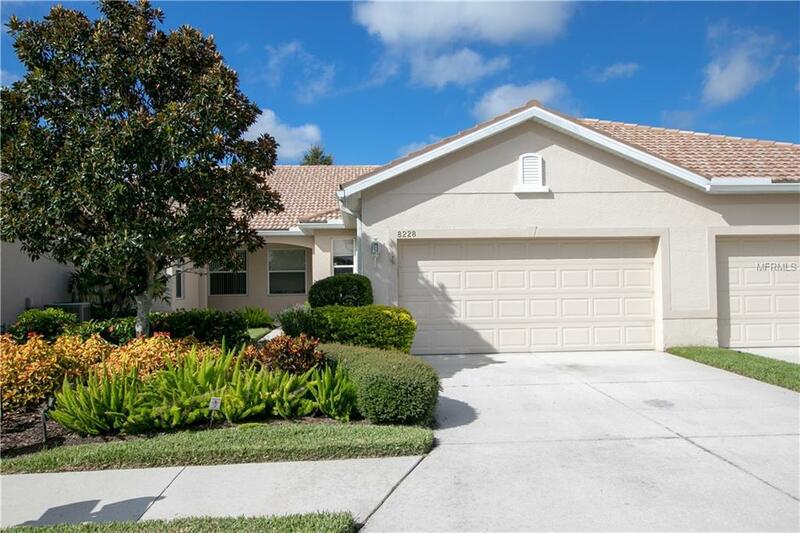 Serene two bedroom two bath villa located in the gated Lakeridge Falls 55+ active community. Surrounded by maintained ponds, lush open grass landscapes, private pathways throughout the community, clubhouse, community pool and more, this villa offers everything in a perfectly sized package. When you first arrive onto Ashford Falls Court, you will be pleased to see it located on a private drive. When you enter the home through the lushly landscaped pathway, you will be greeted by aesthetically pleasing designs with arched doorways, and tiled floorings. The Kitchen itself features recessed lighting, hardwood cabinets, tiled backsplash and gas stove, all of which looks out onto the living with its semi-open concept design. With plenty of space for a full-sized dining set and a spaciously sized living room, this home is unquestionably welcoming to guests. The large master bedroom features a walk-in closet, full sized bathroom, private access to the lanai and views out to the backyard greenery. In addition to the lanai, there is also a guest bedroom, bathroom, den, and two car garage. So come see for yourself what this villa and+ Lakeridge Falls has to offer! Additional Lease Restrictions 6 Month Minimum Once Per Year.